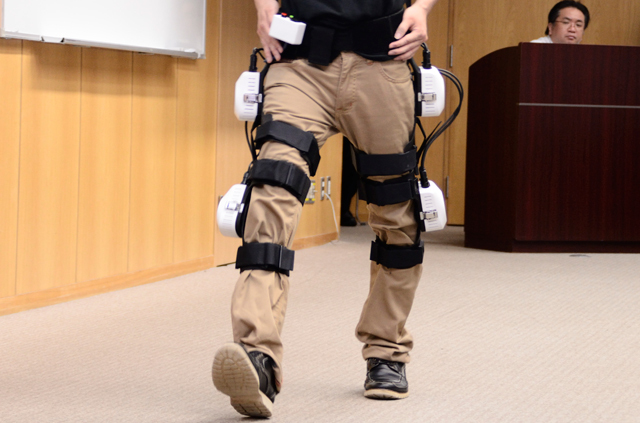 On July 16, 2015, Shinshu University’s Interdisciplinary Cluster for Cutting Edge Research (ICCER) held a kick-off symposium for its Walking Assistance Cyborg Project at the Faculty of Textile Science and Technology. This project is a collaborative venture between the Institute for Biomedical Sciences (IBS), Institute for Fiber Engineering (IFES), Center for Energy and Environmental Science, and Institute of Carbon Science and Technology (ICST). These institutes are all part of the Interdisciplinary Cluster for Cutting Edge Research (ICCER), which brings together Shinshu University’s unique pioneering research under a single roof. The project is led by Professor Naoto Saito (biomedical engineering), director of the IBS who specializes in the development of biomaterials and medical devices. Other eminent figures working on the project include Professor Minoru Hashimoto (robotics) of the IFES, developer of “curara®” robotic wear that is worn externally to assist with movements in daily life, along with Professor Katsuya Teshima (functional materials chemistry), director of the Center for Energy and Environmental Science, who has developed batteries using new innovative technologies. 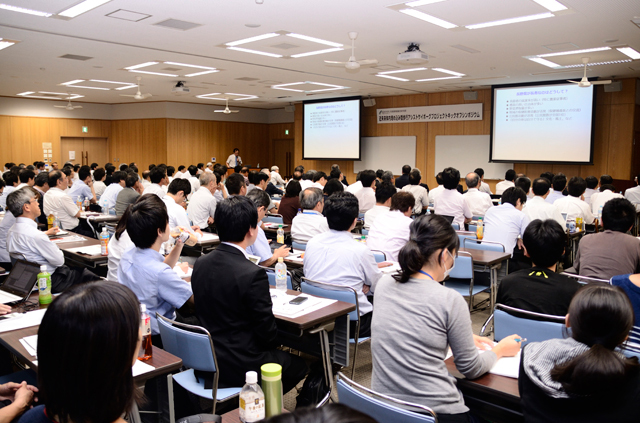 It is the first collaborative research project in Japan among the fields of medicine, engineering, and fibers, uniting Shinshu University’s medical device development, treatment of cranial nerve diseases, and movement function evaluation technologies (medicine) with robots, batteries, carbon, and fiber technologies (engineering and fiber engineering). 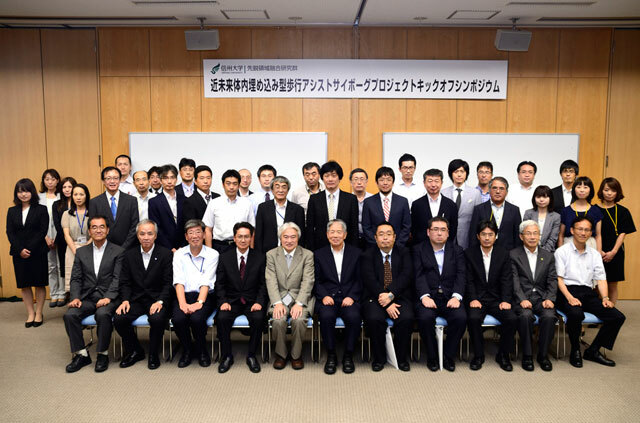 Not only this, but with the support of the Ministry of Education, Culture, Sports, Science, and Technology (MEXT) and the Japan Science and Technology Agency (JST), it also serves as a conventional collaborative research project among industry, academia, and government, in which businesses from within the prefecture and beyond will participate. In addition to all of the researchers contributing to this project, the symposium was attended by guests from the Ministry of Education, Culture, Sports, Science, and Technology and the JST along with numerous representatives from related businesses and other organizations. With a total of around 240 people present, it turned out to be an extremely lively kick-off event.